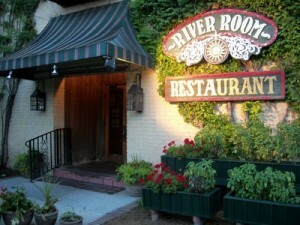 Seafood platters were $7.95 when the first guests enjoyed meals at The River Room. Of course in those days, 25 years ago, buildings on the waterfront sold for $14,000. Since those first diners enjoyed fried scallops and deviled crab a lot of change has taken place, and much has stayed the same. Partners Sid Hood and Sally Swineford opened the original location in 1984, and it was a short distance down the street from the current River Room. The leased space flooded when it rained, and customers trying to enjoy their cheeseburgers could end up ankle-deep in water. Despite that inconvenience the restaurant was extremely popular, and a need arose to provide more than the 48 seats the little eatery offered. Sid and Sally decided to buy a building and move the River Room when the right opportunity came along. Soon their dream property became available: a 19th-century commercial building beside a city park in the middle of Georgetown’s historic colonial waterfront district. The River Room, which is at the intersection of Front and Broad streets, was built in 1888 as the J.B. Steele Building. It housed two businesses known as the Steele-Moses stores. Downstairs, customers inspected dry goods and groceries displayed on massive hardwood counters, and upstairs they could be fitted for custom-made hats. The Steele-Moses stores remained in operation for 50 years, and then were used for a series of department stores and shoe stores. The upstairs became a tailor shop and, finally, an apartment and office space. In 1986, Sid and Sally took the building down to its bricks and bones at the start of a two-year renovation. They uncovered handsome antique brick walls and repaired an ancient elevator. Under layers of linoleum they discovered spectacular hardwood floors of varying plank-widths. Between the linoleum and the wood was a layer of turn-of-the-century newspapers; many of them are now framed and on display in the restaurant. The late Alex Van Kuren was the project’s architect, and he and Sid and Sally worked long days to create Sid’s vision for a seafood restaurant with historic character. When the property was ready for business on April Fool’s Day in 1988, there was no grand opening. The couple simply started serving food. One of their first menus lists the Shrimp and Grits for which the restaurant is now famous. Other choices included Bourbon Shrimp, Steak Oscar, an Oyster Sandwich and Grilled Grouper. Not long after renovations were completed, Chef Joe O’Hara went to work in the River Room kitchen. He’s still there today making creamy Shrimp and Grits with tasso ham, McClellanville Crab Balls, Spicy Crawfish Dip, Herb-Crusted Grouper with Citrus Mojo, and Petite Filet with Cajun Oysters. In the two decades since the River Room opened, Sid and Sally have seen many changes take place around their business. A downtown revitalization project brought sidewalk and road improvements. The addition of an attractive Harborwalk makes it easy for boaters to dock and visit Front Street, and for strollers to appreciate the beauty of the Sampit River and Winyah Bay. Hurricanes have blown in, and one of the worst was Hurricane Hugo in 1989. Sid and Sally rode out that storm on the River Room’s upper level, ready to take action if their new business suffered damage. Sid had to prop up the building’s facade with 2x4s when the windows blew out. The children of their first customers are now old enough to sit at the bar, and many of their original young dishwashers and servers are now middle-age parents. Sid bought a 57-foot pleasure boat they named the Shrimp and Grits, and for 10 years it was docked behind the River Room. They had a lot of fun taking friends and co-workers out for cruising and fishing.